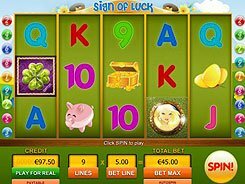 Sign of Luck is a Gamescale-developed 5-reel game themed around luck and money and fitted with 9 paylines. On the reels you will come across traditional 9-Ace playing cards and an array of themed symbols like a piggy bank, a golden horseshoe, a treasure chest, etc. 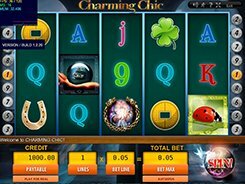 The betting limits are typical of most five-reel slots produced by Gamescale and vary from $0.1 to $45 per spin. 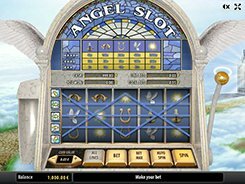 The slot features a wild, a scatter and a free spins round. 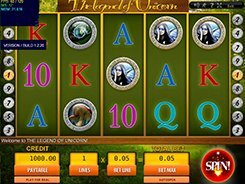 The wild depicted by the Lady serves as a replacement for other symbols; besides, it pays out the slot’s jackpot of 10,000 coins ($50,000) if these five occur on a payline you have wagered on. Furthermore, the wild doubles payouts in a combination it completes. The scatter (Clover Leaf) awards a win of up to 250 times a total bet ($11,250) if 3+ land in any position in view. 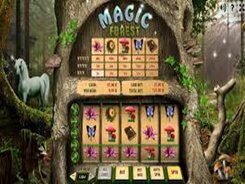 Moreover, three or more scatters activate 15 free spins with all prizes multiplied by x3. 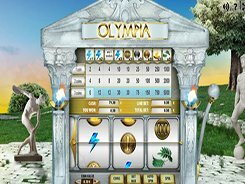 With a pretty standard gameplay, decent payouts and average bet amounts, the slot will suit any budget and playing style. PLAY FOR REAL MONEY!